Ignacio drew his breath sharply through his teeth and furrowed his brow as he surveyed the damage. He was thinking about what to do to save it, and I was dreading what that might entail. Cutting off the little silver cup and hammering the shank back into a square shape? Then having to re-drill and re-solder the silver cup with a new pin??! Suddenly Ignacio turned on his heel and beckoned me to follow him. He took a ring mandrel (a long tapered metal tool for enlarging rings) off the wall of tools, where the place for each one is outlined in black marker. He positioned its handle upright in the bench vice and gradually pushed the ring down the vertical mandrel to the required size so that it forced the metal to straighten itself back into the original square shape. I was stunned at how quickly and easily the problem had been solved! Ignacio told me never to worry about such mishaps. ‘È sempre possibile riparare gioielli’ (it’s always possible to fix jewellery) he said with a smile and took off across the studio, beckoning me again to follow him. We arrived at Agasi’s bench where I was briefed on how to prepare the silver cup for the stone. Agasi showed me where the silver was a bit too thick to encircle the stone, and demonstrated how to thin it down with a needle file and a rotary tool fitted with a little emery paper disc. I then used a strip of emery paper to polish the bottom of the silver cup where it meets the ring shank. Because there was such a risk of breaking this particular stone Agasi said he would set it for me and show me exactly what to do. After my earlier disaster in the polishing room I was happy enough to leave it in the hands of an expert! He filed the crisp edge off the bottom of the stone and tried it for size in the cup. Using the rotary tool with a small grinding bit, he altered the interior of the silver cup until the stone nestled in it perfectly, looking like a little acorn. Next he took a bezel pusher (small tool for stone setting) to the side of the cup and pressed the edges of the silver onto the stone, rotating the ring fully a few times so that the entire circumference received equal pressure treatment. Agasi emphasised how carefully this had to be done so as not to damage the stone. One slip of the hand and it would be ruined. After much bezel pushing and burnishing the stone was finally part of the ring. I was so grateful to Ignacio and Agasi for snatching victory from the jaws of defeat. That’s my new name for the polishing machine by the way. Ignacio came over to inspect the final product and was very happy to see that the stone had survived the setting process. He told me he would hold onto the ring for a day in order to have it photographed. Part of me wished I had taken a photograph of the ring after its tussle with the polishing machine to contrast it with the much happier looking finished piece. I briefly tried it on before Ignacio whisked it away for safe keeping into one of the little wooden drawers in his bench. Without a pause we were discussing the next piece to make. Another ring, a harder stone, and a less complicated round ring shank. Happy days! The next day, I began to prepare the cast silver cup for the uncut rose quartz stone chosen earlier. I was trying to remove a rough lump of silver, leftover from the casting process, from the bottom of the cup, but it was difficult to hold the tiny cup steady on the wooden bench peg, and the rim kept digging into my fingertips. Ignacio showed me how to fix the piece of silver in cera lacca (a type of red wax) atop a wooden stump. With the silver cup firmly secured, and the sharp rim pressed into the wax, I could cut and file the bottom of it without losing my grip or hurting my fingers. 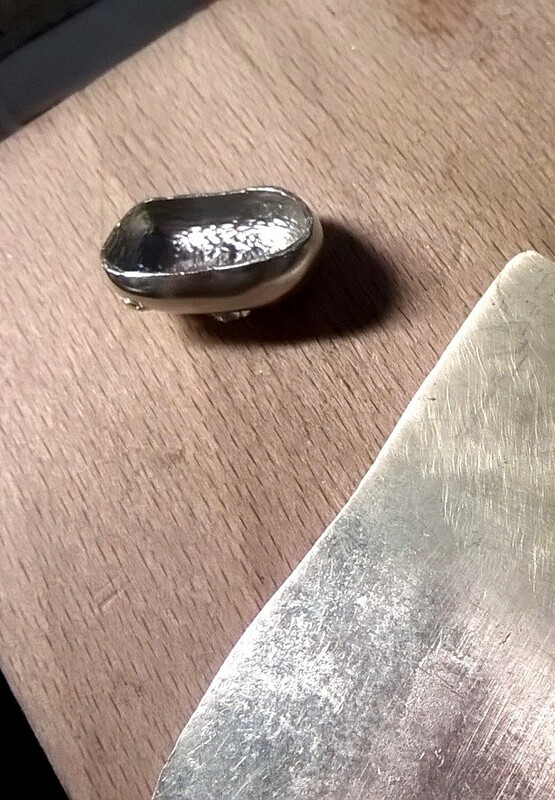 In order to make the shank for this new ring I needed a length of silver so I cut a piece from my remaining slab. Having another workout with the rolling mill didn’t really appeal to me, so I took it easy passing the metal through the rollers this time and reduced the depth of the metal from 2.5 cm to 1.5 cm with a lot less exertion. I marked a straight line along the edge of the silver sheet and filed the metal down to meet it. Ignacio appeared at my bench and did his usual inspection of the work, gave his approval and then told me that I had done enough with it for now and to leave the work aside. He wanted me to return to making wax copies of the bombato ring so that I could have two projects on the go at the same time. Working with the wax injection machine can entail waiting around for it to heat up, and waiting for wax copies to cool down, so it makes sense for me to have the rose quartz ring to work on during those waiting periods. I wasn’t exactly overjoyed at the prospect of returning to the wax injection machine due to my largely unsuccessful attempts to produce viable wax models the last time. But I’m here to learn, so I was prepared to give it another shot. About 45 minutes of trial and error elapsed and again, no viable copies resulted. Ignacio had a go and made a perfect copy on his first attempt! So frustrating! I had no idea what I was doing that could be producing such vastly different results. I figured maybe I didn’t have a strong enough grip on the mould, but it was too late to keep experimenting as I had to run and catch my train. Ignacio said that was one reason I wasn’t having much success with this – you can’t rush it! I made a mental note of that and raced out the door. 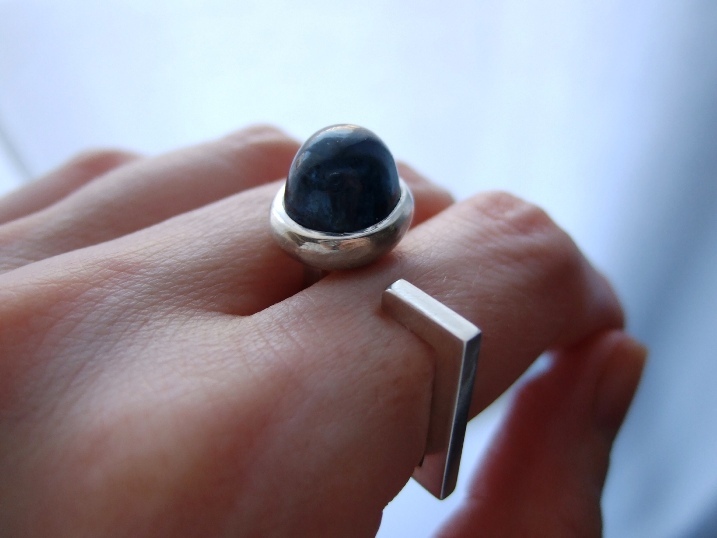 Next ›Levitating ring and the invading brass band!